Attacked in Africa, soon after arrival, I was attacked by this "wild" African animal and I have been tormented by Chichico, our hosts' pet squirrel every day. I am looking forward to our road trip to the Chobe reserve in Botswana so that I can be around some less dangerous animals, elephants and lions. A face only a mother could love, my first wild African animal. Within minutes of entering Krueger, our first lions of the day, they're waiting on mama to return. I'm just a tree and you can't see me. Why don't they put saddles on these guys? Who do? No, a kudo. wildebeest.....Why do they call him beast? Looks like cows to me and also to the lions. One buffalo's pile of crap is another AFrican dung beetle's feast. Aren't the males always the prettiest? Awesome. Not much more can describe it. We're at some friends' house outside of Krueger Park. warthogs, water buffalo and girraffes in their backyard. Went to Krueger today, saw 4 of the big 5, more water buffalo, lions, elephants and rhinos, going to Chobe in search of leopards and more lions on Friday. I'll have internet service until about noon on Friday. Do I get tired of fishing? I was asked this question this weekend and for the first time, I hesitated. 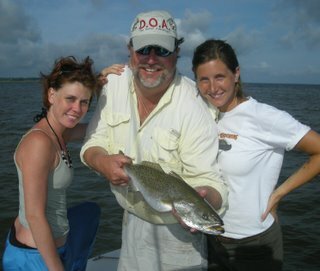 Usually, there is no hesitation, NO, I do not get tired of fishing. The biggest reason is that the fishing always changes. About the time that I'm "tired" of something, the season changes and there is something new to chase. But with a livewell full of baby menhaden in search of flounder and 20 inch pups, I hesitated. Flounder and pups were not what I had on my mind. Do I get tired of fishing? With the big drum, after two months of pounding on them, I'm ready for the fall fishing on the coast, albies, kings, big speks, pups on the beach. Even in Costa Rica, after three months of billfish, I'm ready for some "agua dulce". With the stripers on the Roanoke, by the end of April, I'm tired of fileting stripers and looking forward to catch and release topwater action. After a couple of weeks of watching stripers eat zara spooks, I'm ready for the cobia. The cobia....I almost thought that I had missed it this year, there were big reports of great cobia action by the first of May, when I still had two weeks left on the Roanoke. I got to the coast just in time for a hard nor'easter which put the cobia fishing on hold for another week. When the water warmed, the cobia fishing turned back on and it hasn't turned off. Am I tired of cobia fishing? NO, NO, NO. Even though an 80 pounder aggrivated me for over an hour today and I drove away from that fish totally defeated, I'm not tired of them, just more determined. The only thing that is more frustrating, challenging and rewarding are the tarpon, which is what I had on my mind while riding that livewell full of menhaden to Raccoon Island this weekend. After seeing a huge school of tarpon in the ocean the day before, I felt like there were already some fish in the Pamlico Sound and maybe even the river. Yeah, we got the flounder and pups OK, but it was heartbreaking to run accross three big bunches of tarpon on the way home from the sound.....without a big stick on the boat. Over the last 4 days I've fished in the Neuse two days and in the ocean 2 days, I've seen a lot of tarpon in both places. Last year was the best year of tarpon fishing in 5 years and things are getting set up for a fantastic year this year as well. Do I get tired of fishing? Sometimes. But now is not one of them. I pulled the tower boat out of the water today. Anna has a "honey-do" list about a page and a half long. I need at least two days in the "office" to catch up. We've got to pack for an upcoming trip of a lifetime (we've been invited on a photo safari to South Africa). Do I get tired of fishing? No, no, no, not now. The boat is on the trailer, but it isn't even dry and I want it back on the water. I'm landlocked and frustrated. I want to watch the sunrise over my chumslick. I want to harrass that big cobia until she bites. I want to be looking for those cobia caught on the shoals today. I want to spend a little time figuring out those tarpon that I keep seeing in the ocean. It's going to be a long three weeks before I get back out there. Most of the cobia will be gone and I will have missed the beginning of the tarpon bite.....yeah, I know, no sympathy from you. Anyway, unless I get few things checked off the honey-do list and an invite to go fishing this week.... I'll be fishing vicariously through all of you. I appreciate the reports, even though there probably won't be internet service while on safari. Anna and I will be here for a few more days, but while we're gone, give Capt. Ray a call at 252-670-9767. He'll be fielding some calls and will rig you up with one of the "Down East Guides". 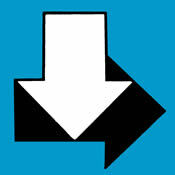 Welcome to the new website of Down East Guide Service. Be sure to save this address and pass it along to your friends. The tarpon have arrived a couple of weeks early and in strong numbers. Two days ago I saw a large school in the ocean. Today we saw good numbers in the river. Also down the "west" beach, there were good reports of sight casting cobia. The last couple of days I've been beating the banks, squeeking out the day with keeper flounder and pups. Seeing the tarpon two days in a row got me fired up, hopefully my crowd tomorrow will be willing to give them a try......and they are still there. so you wanna catch a fish that pulls? Well, it's a great time to get out after them. Plenty of amberjacks are fairly close to the beach and the big sharks have showed up behind the shrimp boats. On the way home from playing wtih "jaws", we checked out the area where the bait balls and cobia have been, sure enough, they were there, catching 3 of 5 in short time. This is the pic of the fish that bit the dust yesterday, today the wind was blowing and we ended up bait fishing, catching plenty of sharks, nice bluefish, spanish for dinner.....and one small cobia. Anna and I have been invited as guests to check out a couple of lodges in South Africa. This is an opportuntiy that we just cannot refuse. Unfortunately, we both will be unavailable from June 19 to July 7. Please contact us immediately to finalize the details and dates on these trips. We apologize in advance for not being available from June 19-July 7. 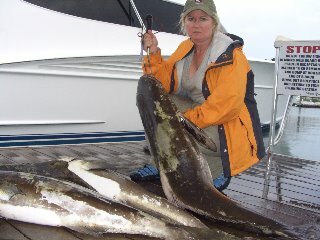 Until the 19th, I plan on adding a few more cobia to the "count" and checking out the good fishing reports from Capt. Gary and Capt. Mark in Oriental. I almost forgot...we also saw a pair of tarpon on Cape Lookout Shoals today. I have plans for them also. This is a shot of what Capt. Ray did to the deep water fishes over the weekend. Some more great cobia fishing today, catching a pair of keepers in both the morning and afternoon trips, plus some throw backs and a lot of missed opportunities. Have plans for the ones that we missed tomorrow. The streak has ended....We got our keeper cobia this morning, but the clouds set in this afternoon and the sight casting was over. That made it 9 trips in a row with keeper cobia in the box. The afternoon trip was not a total loss, with plenty of Spansih for dinner and MAXIMUM PULLEDGE with the amberjacks. "Pups, flounder and specks were snapping today on both cut bait and artificials. Plenty of slot pups and keeper flounder and specks pushing four pounds to round out the morning." The killer cobia bite held up again today, catching 10 by 10 this morning. Pictures to follow.....including pics of the several 30-50 pounders that we released. Not only are they not all gone, but there are a lot of fish here. Sometimes the Crystal Coast misses out on some of the best cobia fishing as they bypass us on the way north. Not the case this year. Since the water has warmed after the nor'easter, bait fishing has been steady and sight casting really, really good. Yesterday we saw at least 20 fish, hooking 11 and landing 7, including a 60 pounder. Today we saw 15 or more, catching 4, including a double header of 50 pounders. One of the fish that we saw today was gigantic, at least 80-90 pounds, of course the little 30 pounder eats the bucktail instead.....the little guys are better eating anyway.